"I have to say, that there are times where the dysfunction in the Senate just goes too far. This is an example of it," Obama said at a press conference on Friday. "It’s gone too far. Enough. Enough. Call Loretta Lynch for a vote, get her confirmed. Put her in place. Let her do her job. This is embarrassing, a process like this." 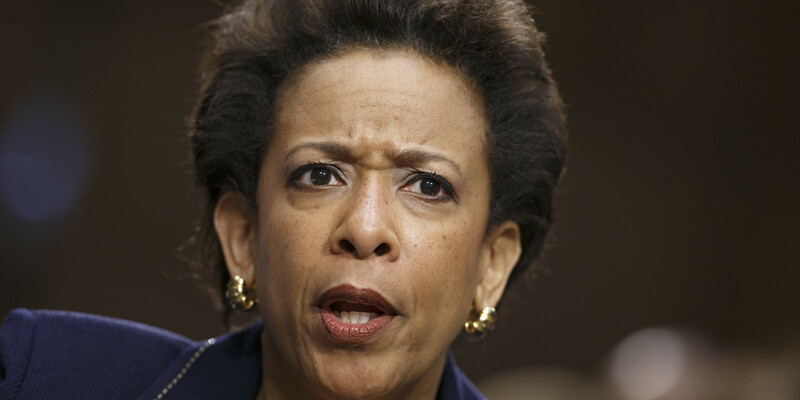 President Obama nominated Lynch in November to replace Attorney General Eric Holder. The Senate Judiciary Committee, chaired by Sen. Chuck Grassley (R-Iowa), held confirmation hearings on Lynch's nomination in late January, but confirmation has been delayed as Senate leaders from both parties wrestle over a human trafficking bill. Still, though, many Republicans in the upper chamber oppose Lynch's confirmation due to her positions on a variety of policy issues, including apparent deference to virtually unchecked executive power. In addition to other problematic positions she has taken, Paul has staked his opposition Lynch over her support of controversial federal civil asset forfeiture laws, which, during her confirmation hearing, she called "a wonderful tool." "I have a question for Barack Obama. Do you support civil asset forfeiture and Lynch's unconstitutional theft: because THAT is what's embarrassing," Paul wrote on Saturday. "In our country, you should be presumed innocent until found guilty. Civil asset forfeiture doesn't allow for the presumption of innocence. The government can take your stuff without being convicted of a crime." "The Washington Post did a series on this. They found minorities and the poor are disproportionally affected by civil asset forfeiture. Do you know who is the biggest defender of this corrupt policy and defended it recently? Loretta Lynch. That's why I oppose her nomination," he added. The 2014 Washington Post series, "Stop and Seize," Paul referenced exposed gross abuse of federal civil asset forfeiture laws by state and local law enforcement agencies. The federal government will adopt property seized by state and local law enforcement agencies and return up to 80 percent of the proceeds to them through the Justice Department's Equitable Sharing Program. "There have been 61,998 cash seizures made on highways and elsewhere since 9/11 without search warrants or indictments through the Equitable Sharing Program, totaling more than $2.5 billion," the Post noted. "State and local authorities kept more than $1.7 billion of that while Justice, Homeland Security and other federal agencies received $800 million. Half of the seizures were below $8,800." Though only one-sixth of the seizures were challenged, which the Post attributes to cost of a legal battle to get property returned, the federal government returned wrongfully confiscated cash in 41 percent of cases in which there was a challenge. It has become routine for state and local law enforcement to rely on proceeds from seized property to pad their budgets, but, when it comes to federally facilitated forfeitures, those that do this are defying federal law. "Hundreds of state and local departments and drug task forces appear to rely on seized cash, despite a federal ban on the money to pay salaries or otherwise support budgets," the paper explained. "The Post found that 298 departments and 210 task forces have seized the equivalent of 20 percent or more of their annual budgets since 2008." Lynch, during her tenure as the US Attorney for the Eastern District of New York, used civil asset forfeiture fairly liberally. The Wall Street Journal called it her "money pot." In just 2013 alone, her office seized $904 million worth of cash and property. One of the seizures in which Lynch participated involved Bi-County Distributors. In May 2012, the IRS seized the New York-based convenience store distributor's bank account, confiscating $447,000. The IRS suspected "structuring" -- an alleged attempt to avoid federal reporting requirements through frequent cash deposits under $10,000 -- but the business had made deposits below the reporting threshold on the advice of their account. The business owners -- the Hirsch brothers, Jeff, Mitch, and Richard -- were never charged with a crime and fought the seizure in court. In January 2015, more than three years after the seizure, Lynch's office, very quietly, returned the wrongfully seized cash to Bi-County Distributors. Despite the overwhelming evidence of abuse, through wrongful seizures by state and local law enforcement and the IRS, Lynch defends the pernicious practice, which completely undermines the right to due process protected by the Fifth Amendment. It's troubling and, as Paul put it, embarrassing that the individual being considered to serve as Attorney General would view civil asset forfeiture as "a wonderful tool."